I'm going to start whipping out quickies. Stop me and ask questions if you want more details about anything, okay? Okay. Sometimes words spoken are the ones you've been afraid to think, but once they're said aloud there's no way to make them disappear. There, on a clear evening, in a town where it seemed nothing ever happened and nothing ever changed, these three friends decided to take hold of their fate. 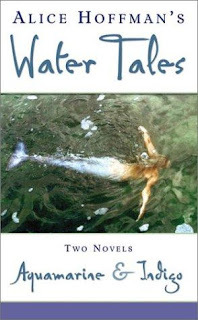 I snatched up this copy of Water Tales at my library's perpetual sale, this week, and gobbled them right down. Both are about young friends facing uncertain futures. In Aquamarine, two girls who have been best friends and neighbors are spending their final summer together hanging out daily at the Capri Beach Club, which is going to be bulldozed at the end of the summer. Claire is going to move to Florida with her grandparents and Hailey promises not to make friends with whoever moves into Claire's house. Then, they are forced to face their fears and the future when a mermaid shows up in the Capri Beach Club's pool after a heavy storm. In Indigo, Martha and her two friends Trevor and Eli (nicknamed "Trout" and "Eel" for their webbed hands and feet) spend time up on her roof and then hatch a plan to leave town. Martha's mother has died and her father hasn't recovered. A woman named Hildy has forced herself into their lives but she has no interest in Martha. Trout and Eel are adopted and yearn for the sea, but they were adopted during a vacation the McGill's took to the shore and have since been stranded in dry Oak Grove. Why won't their parents allow them to see the ocean? What should Martha do about Hildy? I can't say I completely fell in love with either of these stories, but they had very uplifting and admirable common themes of friendship and taking control of your destiny. Alice Hoffman's writing is always quirky and kind of delightful but bears the weight of realism and I'm awfully fond of her style. I'd definitely recommend the stories, but don't expect anything overly enchanting or deep. So . . . if I hurry up and re-donate the book to the library sale, do you think I can sneak out of ditching 10 books in its place? I enjoy Alice Hoffman's books for their quirkiness. Me, too. Hoffman does quirky with style. I love Alice Hoffman but the last one I picked up last week, I couldn't get into. To be fair to AH, I think I was in a non-reading space though. Didn't you do the November novel thing? That happens. I just realized I DNF'd another book, last night. Totally forgot about that one. I guess I'll get to it. I have a lot of reviews to whip out. No, actually, I planned to join in on NaNoWriMo and was all excited, raring to go . . . in October. But, by the time November rolled around I honestly wasn't in the mood. There was too much going on, for one thing, between house-hunting and physical therapy. I opted not to push the issue. But, next time the mood strikes, I'm just going to go ahead and write when I'm ready.